I was wondering how the hardness of my 45 BHN cast bullets compared to the hardness of jacketed bullets. Googling turned up a wide range of hardness numbers for copper or gilding metal. Some sources say as low as 35 BHN. That didn't seem right, though. As always, it's best to test and measure stuff yourself rather than rely on internet experts. I didn't have a thick chunk of gilding metal handy but I did have a Barnes X bullet, supposedly made of copper or some soft copper alloy. So I sawed the nose off an X bullet, filed the cut halfway smooth, and ran a BHN test on my homemade tester. 7.9375 mm (5/16") indenter, 150 kg force applied for 30 seconds. Then I used a cheap USB microscope to photograph the indent along side a 100th's of an inch scale. GIMP's pixel measuring function was used to measure the indentation and compare it to the scale. 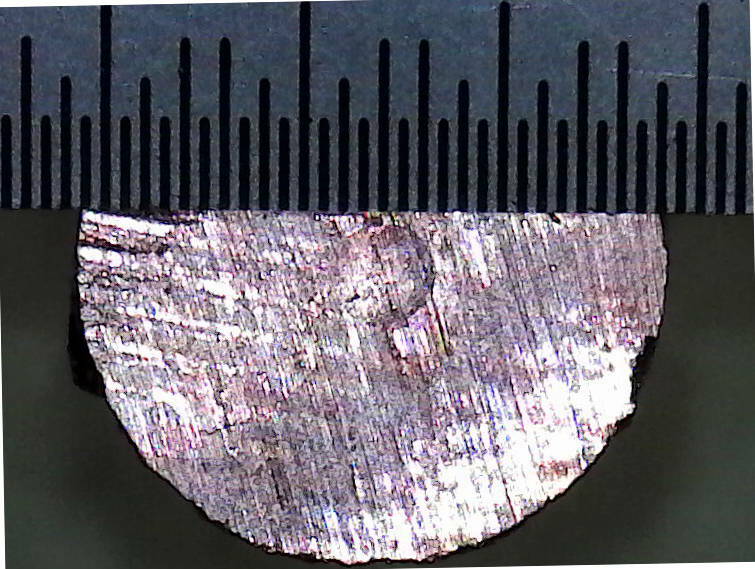 Result: the indent was 0.0508" diameter, or 114 BHN. Conclusion: even my 45 BHN cast bullets are still significantly softer than a copper bullet.